Noko can keep track of expenses for you and you can also add generic line items to your invoices. Click Projects in the green navigation sidebar. Find the project the expense is in and click the project title. In the Expenses & Line items area, add an amount (without a currency symbol) and a description, and choose whether the expense or line time should be taxable in the final invoice, then click the little + button to save your expense. When you're ready to invoice your expense or line item, just create a new invoice. In your invoice, make sure that the Include all unbilled expenses checkbox is checked. 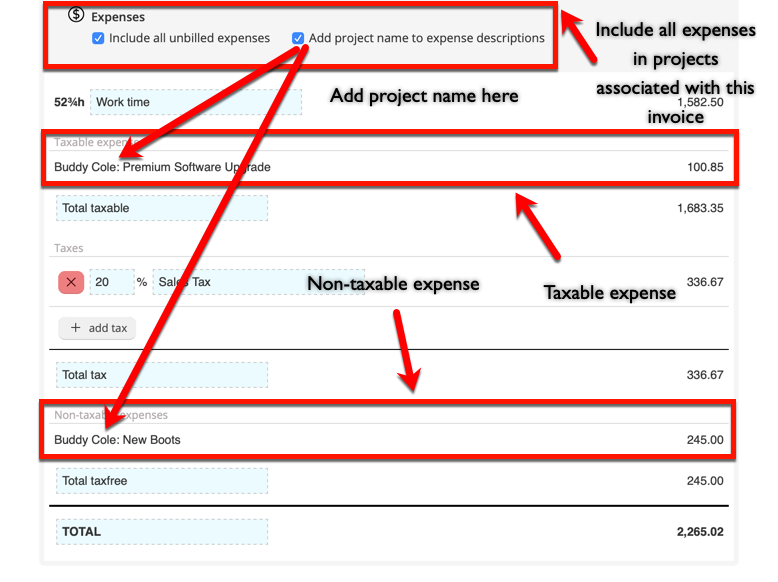 If you like to see project names for the expenses, also check the Add project names to expense descriptions checkbox (this is great for invoices that span multiple projects!). In the Expenses & Line items area, hover over the expense you want to delete and click the red X button.